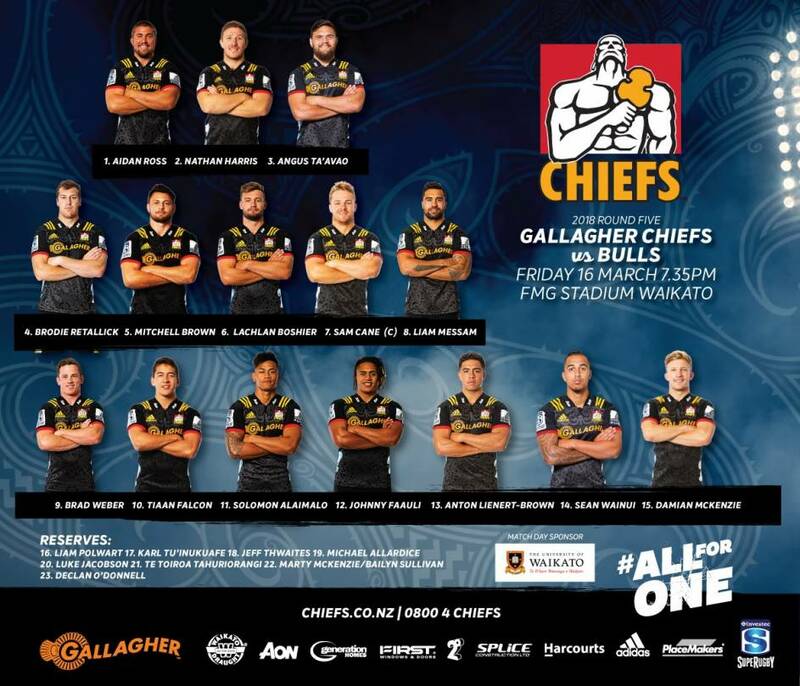 The Gallagher Chiefs are back in action this Friday when they take on the Bulls in the first exciting home clash of the season at FMG Stadium Waikato. The home side have had a week to recoup with a bye last week, after they managed a gruelling 27-21 win over northern neighbours the Blues in round three. Head Coach Colin Cooper was thrilled for the team to be able to run out in front of the passionate home support. Cooper has made four changes to the starting fifteen who competed against the Blues nearly a fortnight ago. There are three changes in the forward pack with Angus Ta’avao replacing the injured Nepo Laulala at tighthead, Mitchell Brown coming in to partner Brodie Retallick and the impressive Lachlan Boshier moving into the loose forwards. Exciting youngster Tiaan Falcon is rewarded a start at first-five eighth after impressing the coaches against the Blues when he was a late injury replacement for Shaun Stevenson. Angus Ta’avao and Sean Wainui both start, having come in as confirmed injury replacements for Atu Moli and Tim Nanai-Williams for the rest of the season. Wainui played a starring role in the win against the Blues, topped off with a great try, while Ta’avao made a good impact off the bench. Both players impressed throughout the pre-season, catching the eye of the coaches with their hard work and determination. It is a special night for Bay of Plenty prop Jeff Thwaites who could make his Investec Super Rugby debut off the bench. Fans can purchase tickets from www.ticketdirect.co.nz, with prices starting from only $21 for adults and $11 for child. Kickoff is at 7:35pm this Friday at FMG Stadium Waikato.